Peterkin is a jester of international repute! 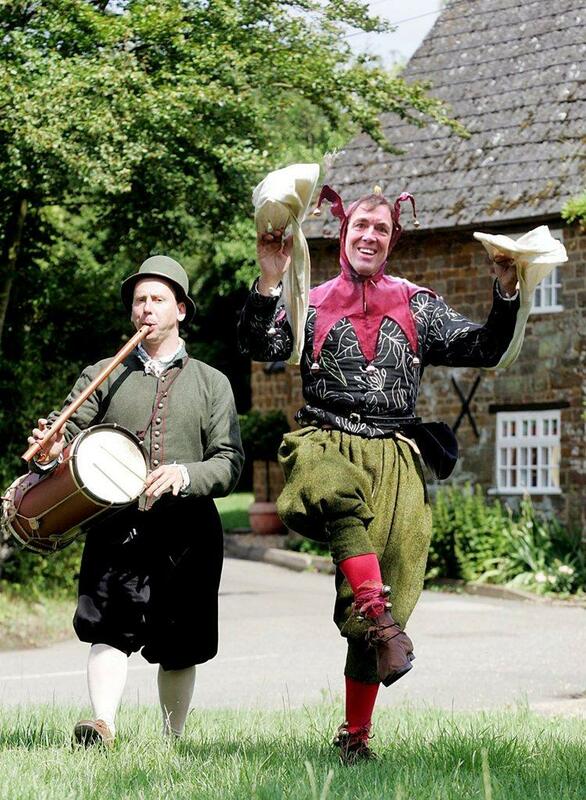 He specialises in presenting entertainment with a genuinely authentic flavour for a wide variety of historical venues and events, bringing his unique style of historical comedy to events throughout Europe and all over the UK. A madcap fool, in the truest sense of the words, whether toppling precariously on stilts, fire eating or balancing upside down on anyone he can trick into lying on the floor. A must have for banquets, outdoor events, themed parties weddings or historical re-enactments. Using the character of the traditional English Fool who ‘hath not so much brains as earwax’ Peterkin embodies the very spirit of folly. Equally at home at a castle, manor house or hotel, he is guaranteed to spread motley mayhem all around. 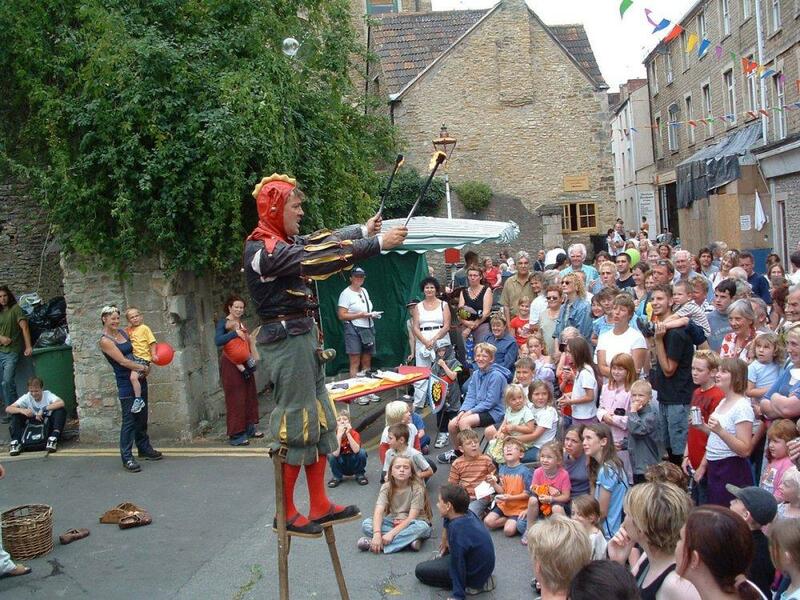 Peterkin can perform throughout an evening banquet, as a walkabout entertainer or he can present his outdoor show involving acrobatics, comedy, fire and stilts it all equates to half an hour of serious silliness. He has researched the nature of fooling and the history of the fool and has devised a character which is as engaging as it is hilarious. 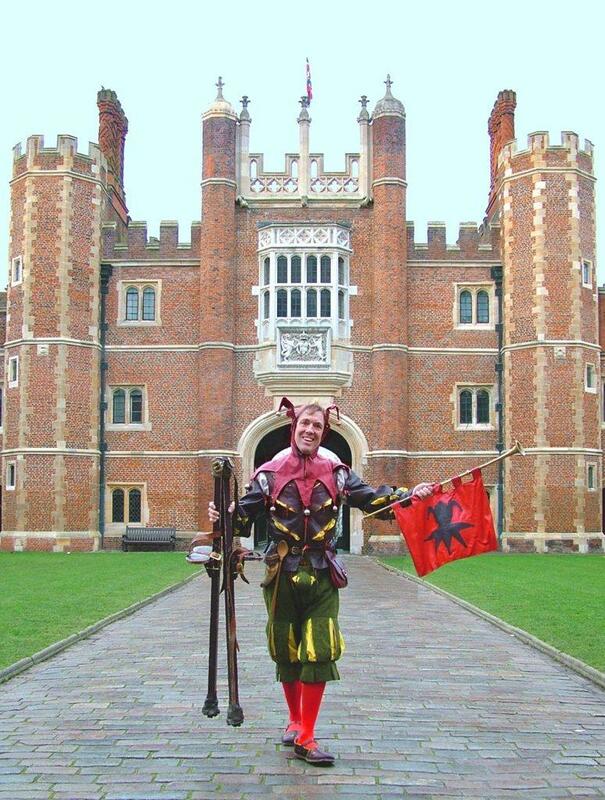 He has been Resident Fool at Hampton Court Palace since 1992. Other clients have included The Tower of London, English Heritage, Sir Cliff Richard and Virgin Trains. TV Credits include Royal London for the Discovery Channel, Blue Peter , TVAM and Landmarks for BBC Schools. 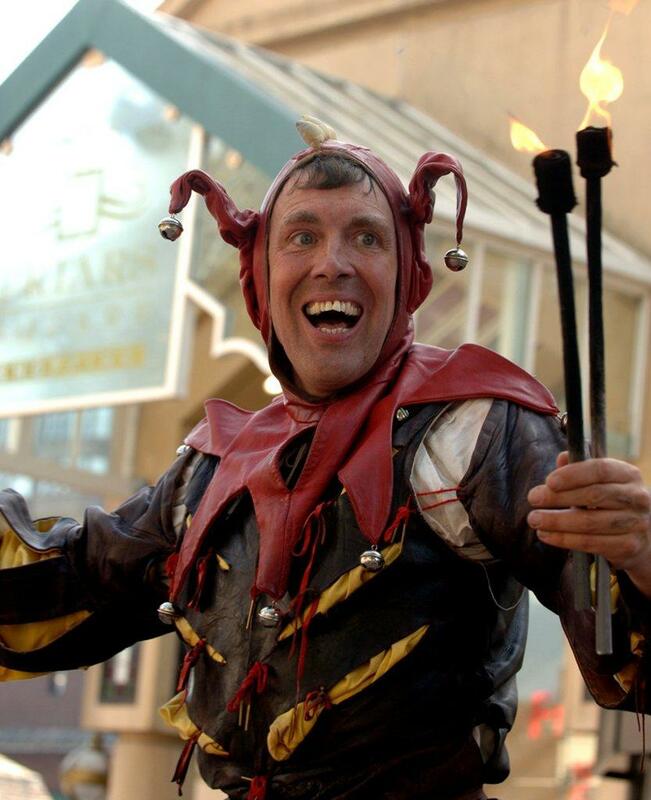 Peterkin was voted ‘European Jester of the Year in 2002’ and is ‘Official Fool’ to the Lord Mayor of Bristol. The performance can be staged indoors with ceiling heights 10 feet and above, outdoors or indoors with an outdoor finale if fire is not possible indoors. If necessary the finale can be performed without fire. 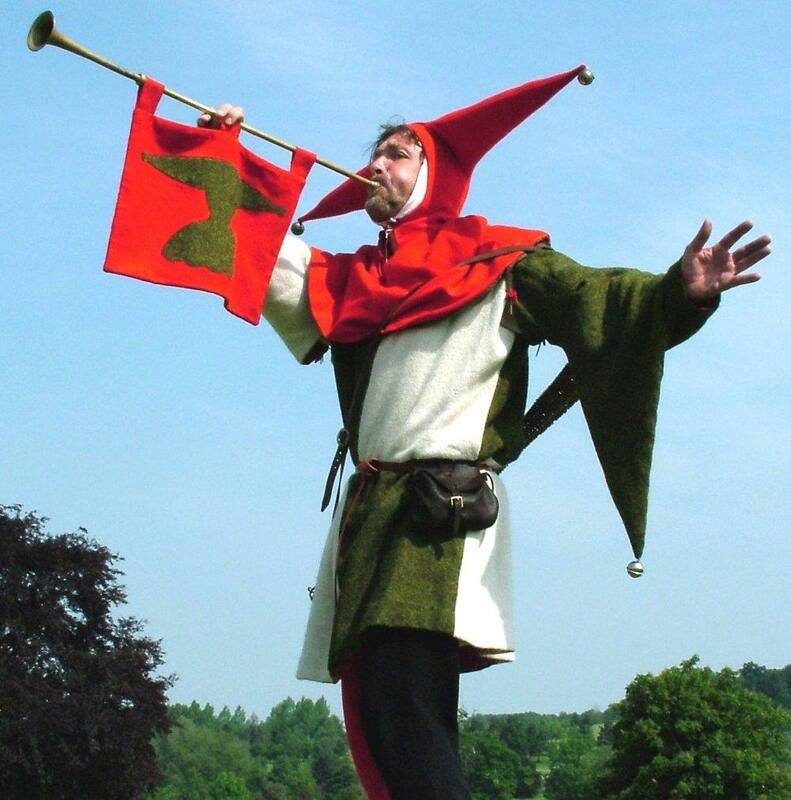 Peterkin gives the experience of the flavour of a mediaeval fool performing at banquets. The performance is interactive, physical and very funny. He can entertain the guests during a drinks reception and interact with them as dinner is called and they find their seats. Before the meal is served he then organizes an election of the Lord or Lady of the Feast using three candidates among those present. This is done with a heraldic horn and testing ‘who may blow the cleanest note’. This works as an excellent icebreaker and introduces the character and style of the fool. Throughout the rest of the meal Peterkin will perform a variety of ‘sets’ between courses. They vary depending on the make up of the guests but include, balancing an egg on his nose, juggling children, performing a hand stand on a guest, various toasts, rules of the table etc. The emphasis of these is always comic but they are also quite physically impressive, including acrobatics, balance and physical dexterity. As the guests enjoy their meal Peterkin can also move among them as appropriate, engaging them with smaller table-based foolishness. 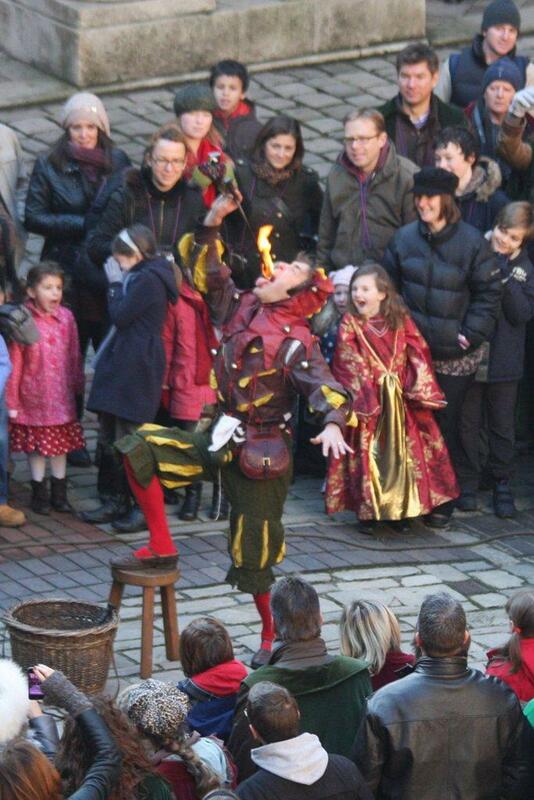 As a finale Peterkin performs fire eating on stilts. This is normally performed in two parts, rising on the stilts in the banqueting hall and then taking the whole company outside to see the fire performance. Peterkin has made a speciality of performing at wedding receptions and breakfasts. He adds a touch of class comedy to any wedding celebration welcoming guests on arrival, announcing and shepherding photo calls and acting as master of ceremonies during the meal. As guests arrive he can welcome them, either with a flourish announcing their arrival with the aid of a fanfare, or in a more discreet fashion with a glass of something special. During photographs he can announce and shepherd people into the appropriate frames and keep those waiting amused with ‘little nothings’, tricks and jests. Depending on the nature of the wedding feast, Peterkin can provide entertainment throughout. Before the meal is served, he organizes an election of the “Lord or Lady of the Misrule” using three candidates among those present. This is done with a heraldic horn and testing ‘who may blow the cleanest note’. This works as an excellent icebreaker and introduces the character and style of the fool. He can then perform a number of interludes between courses or around the banquet as appropriate. The emphasis of these is always comic but they are also quite physically impressive, and can include an acrobatic hand balance on a guest, juggling of children, balancing an egg on his nose and the toast of ‘Wassail’. For fire performance an on site risk asessment must be undertaken prior to performance and the management will need to provide a fire marshal. The acts were brilliant and did exactly what we hoped. They went out on time and interacted with the audience really well. No suggestions for improvements, just keep doing what they are doing!